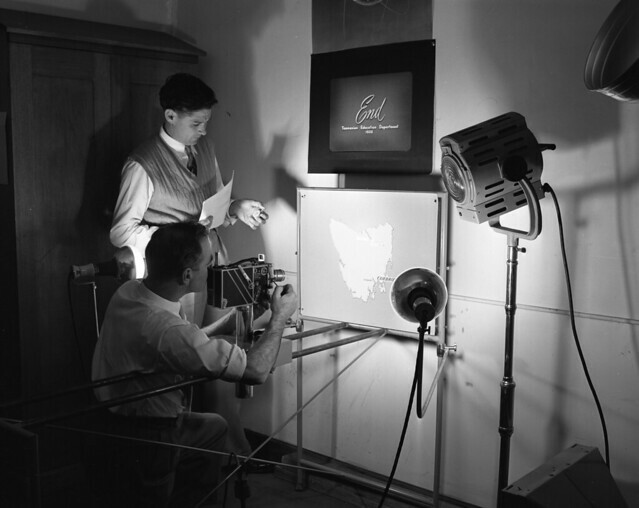 In 1977, the Tasmanian Labor government, under Premier Bill Neilson, was inspired by the successful South Australian Film Corporation to remodel the Department of Film Production into a government-owned commercial business. The Tasmanian Film Corporation was established by an Act of Parliament on 19 May 1977. It's aim was to ‘participate in, and help the growth of, a stable film industry in Australia’. The change brought more creative freedom to the agency, more emphasis on marketing and commercial work, and they moved from 64 Brisbane Street to a more functional studios at 1-3 Bowen Road, Moonah. Listen to John Honey, Tasmanian Film Corporation screenwriter, director and Chief Executive, talking about his work. This recording was made as part of the Tasmanian Historical Research Association’s ‘Tasmanian Life’ series. His account of the Tasmanian Film Corporation starts at 34m 37s. Government-sponsored projects made up the core of its work, but the Tas Film Corp also produced Tasmania’s first full-length feature films and children’s television series. Manganinnie was “Tasmania’s first ever complete, home-grown feature”. The Corporation bought the film rights to the unpublished manuscript of the children’s novel written by Beth Roberts in 1979. Set during the Black War in the 1830s, the story follows the friendship that forms between a young settler girl and a Tasmanian Aboriginal woman when they are both separated from their families. Manganinnie was critically acclaimed. It was nominated for six Australian Film Industry awards, for best film, actress, directing, cinematography and costume design, and composer Peter Sculthorpe won the award for best original music. Writer Ken Kelso received the AWGIE award from the Australian Writers guild for the script. Unfortunately Manganinnie was not a financial success. It was well-received in Tasmania, but box-office sales interstate were disappointing. Created by freelance directors Eddie Moses and Ron Saunders, Fatty and George is the story of three children and their time-controlling hijinks. Children’s entertainment was a high priority for the Tasmanian Film Corporation. Fatty and George was their first kid’s TV series. It was granted a ‘C’ rating, approving it for children’s television, and was screened by the ABC for the first time in 1981. We have posted all ten episodes of this series on our YouTube channel. This spooky children’s mystery was first aired as a TV series, and later a TV movie. The entire series is now available to view on our YouTube channel. Save the Lady was the Tasmanian Film Corporation’s last feature film. This upbeat family film features the Hobart waterfront, and tells the story of a group of children fighting to save a historic ferry. It was screened in Tasmanian theatres in the September school holidays in 1981. The Tasmanian Film Corporation was owned by the government until 1983, when it was privatised by the Gray government. Its archives were transferred to the Tasmanian Archive and Heritage Office, where they have been carefully preserved and gradually transferred into digital formats. Some staff members have been working with this collection for over 25 years. You can view many of the films produced by the Tas Film Corp on the LINC Tasmania YouTube channel. We upload new films every week.